In early 2015, Your Story Wedding & Event Planning was approached by the TLC network to plan the Alaska portion of the pilot episode for Extreme I Do’s; a reality show that would feature weddings in some of the most stunning and logistically challenging locales across the country. Milwaukee bride and groom, Tatjana and T.C. (Thomas) Ward, had never been to Alaska, but had a vision for a magical, winter wonderland wedding. Your Story Wedding & Event Planning had one month to make that dream come true. This was a unique challenge for us, not just because of the compressed timeframe but also because the wedding was to take place in the Anchorage area, and we are a Fairbanks-based business. Luckily, we had the fantastic opportunity to work with several talented and highly professional Anchorage-area vendors who helped us make Tatjana and T.C.’s day perfectly unforgettable. Of course, the glorious weather helped, too. · Tatjana and T.C. were flown in separate helicopters, by Alpine Air, for their first look atop a glacier. There, they had stunning photos taken by Joe Connelly from Chugach Peaks Photography , who documented the entire day, beautifully. · After the first look, Turning Head’s Kennel, took the betrothed on an exhilarating sled dog ride before it was time to prepare for the ceremony. 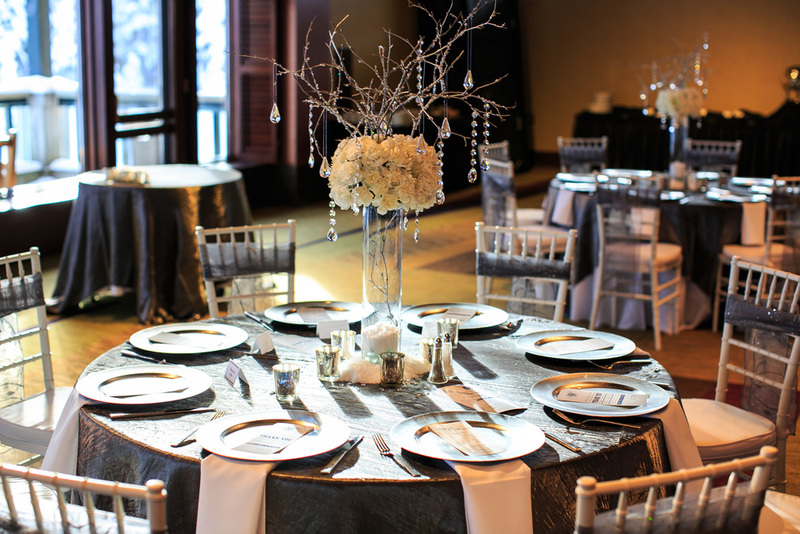 · The ceremony took place atop the mountain at Alyeska—a first for wintertime, at the resort. Ski patrollers escorted the wedding party down from the tram’s roundhouse, to where guests were seated looking out over the surrounding peaks. · Tatjana and T.C. donned fur and snow boots over tux and dress. Tatjana’s bouquet was accented with shimmering crystals and rose petals were scattered in the aisle of snow—just a couple of the elegant touches added by Alaska Bouquet & Events. · The reception occurred just after the ceremony at Kahiltna Court, a ballroom at the resort that was accented with silver taffeta linens, ice twigs and candlelight. Five Star Entertainment created amazing ambience with beautiful lighting and the ballroom was transformed into a warm, elegant, mountain getaway. The experience of planning this wedding presented a really gratifying challenge for Your Story, not just because of the locale and timeline, but also because filming for a reality TV show adds a completely different kind of pressure that is really dynamic. It was interesting to get a glimpse into the world of reality TV and see how the storytellers use their creative license to portray the story they believe will most likely hook their viewers—which isn’t always the way things actually unfold. In the end, we were able give the producers their story, while still exceeding the expectations of the bride and groom by giving them their dream wedding. AND, we ran the event absolutely on schedule. The joy that it brought Tatjana and T.C. was priceless. ©2019 Your Story Wedding & Event Planning. All rights reserved.